In a first, Marines participating in an integrated training exercise at Marine Corps Air-Ground Combat Center 29 Palms, California, got supplies delivered via an autonomous UH-1 Huey in an experiment that offered a glimpse into the future of logistics operations. The legacy helicopter platform was made autonomous with the Autonomous Aerial Cargo/Utility System, or AACUS, which allows an aircraft not only to conduct a mission and return to a given destination with minimal human input, but also to detect and avoid obstacles in the air or around a landing zone. 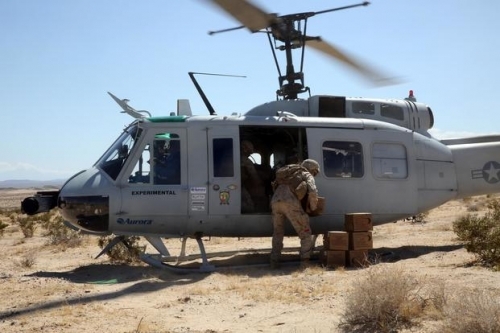 The specially equipped Huey, which is being used for experiments by the Marine Corps Warfighting Lab, delivered supplies to Marines with Combat Logistics Battalion 8. The Camp Lejeune, North Carolina-based battalion was designated late last year as the Marine Corps' experimental unit for logistics, putting it first in line for experiments involving new technologies and systems. The Corps recently wrapped up a nearly two-year series of infantry experiments involving 3rd Battalion, 5th Marines, a designated experimental infantry battalion that trained and deployed during the time period. In addition to multiple resupply missions at various distances and with different payloads, last month's exercise tested the ability of AACUS to refuel from a forward aerial refueling point for the first time. Lt. Gen. Robert Walsh, commanding general of Marine Corps Combat Development Command in Quantico, Virginia, said that the experiments with the AACUS had gone well. "Now we're grinding through the analysis," he said. "What I want is, 'OK, what does that mean, what reduction in aircraft, what reduction in trucks do we need now that we're starting to prove this out so that AACUS can deploy.'" The exercise was the second major Marine Corps test involving AACUS. In a December demonstration in Quantico, AACUS made cargo drops to multiple locations, taking off and landing in autonomous mode.